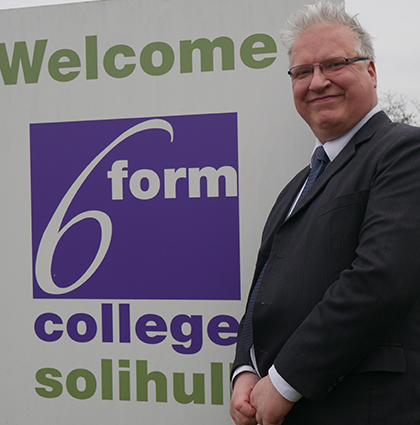 The Sixth Form College, Solihull is announcing a change of leadership with current Principal Paul Ashdown retiring at the end of March and Dr Martin Sullivan taking over as Interim Principal. Dr Martin Sullivan, currently Vice Principal at the College, will take over on 1 April 2017 and guide the College through the months ahead. This will include the application for conversion into an academy and merger with The Ninestiles Academy Trust, which was announced recently. Martin has over six years experience as a Vice Principal, having joined the College from Gloucestershire College in 2010. He started his career as a teacher of Chemistry and Computing. For Principal Paul Ashdown, this announcement brings to an end eight years working at the College and 18 years working as a Principal across four different colleges. The appointment of a permanent Principal will follow the conclusion of the application to academise and merge with the Ninestiles Academy Trust, which is planned to be in August 2017.